Descending the stairs from Victoria Park in Elora, Ontario, you are welcomed onto the river bottom with a number of trails and breathtaking views of the Elora Gorge and the eye-catching David St. Bridge. Among the many wonderful sites that the gorge has to offer is a not-so-obvious and mysterious graffito. Easily missed, but well worth looking for, the inscription is at the bottom of the stairs into the gorge, about 50 feet along the trail next to the escarpment. 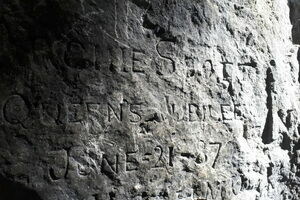 It reads “Archie Scott Queen's Jubilee June-21-87.” This graffito has not only been expertly carved into the rock with a chisel, but is also of historic significance. June 21, 1887, marked the Golden Jubilee of Queen Victoria, in particular, her service at Westminster Abbey, celebrating her 50-year rule as the monarch of the United Kingdom. It was marked by a banquet of 50 European kings and princes, and the minting of a double Florin coin. A Denby Dale pie was even created to mark the occasion. Victoria would go on to rule for another 14 years, her reign ultimately spanning from 1837 to 1901. The popularity of Queen Victoria was such that her birthday—May 24—is still celebrated as a holiday in Canada. It is unclear who Archie Scott was. A Wallace Archibald “Archie” Scott is recorded as having resided in the area of Elora from 1884 to 1966. This, however, would have made Archie just 3 years old in 1887. Perhaps a family member chose his name as a commemoration, or perhaps an entirely different Archie Scott took the opportunity to commemorate the 50-year anniversary of Queen Victoria’s reign. The town of Elora, and its gorge in particular, has been a perennial touristic draw for generations in southern Ontario ever since its founding in 1832. As such, it is possible that an individual from any number of surrounding regions could have taken it upon themselves to inscribe this dedicatory graffito to the ruler of the British empire. Regardless of who left behind this curious mark, it remains a unique dedication to one of Britain's most beloved rulers.